Above is a screenshot of a bagger machine production run. 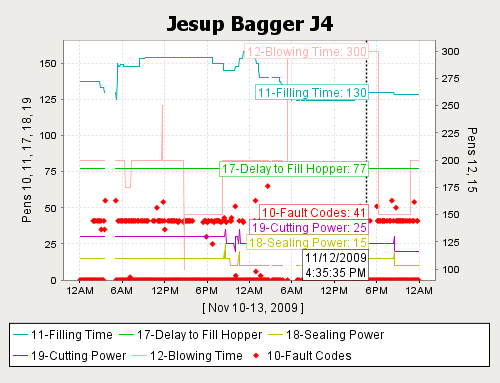 The fault codes (red dots) show what faults the machine had over the course of time. Most dots are when the machine runs out of bags – this is a normal operating fault. The stray dots are important to watch. If there is a pattern, it means there is a particular problem that needs to be looked into. With the addition of a database-centric controls system, Absorption Corp consolidated the data together from its two plants – one in the state of Washington and one in Georgia. The database and FactoryPMI are installed in the corporate office in Washington, and the data is served to various clients within the company network. Now that they can analyze data from both locations, the plants benefit by comparing any similarities or differences in their processes. Since the plants are set up the same, if one has a particularly good production run, the conditions surrounding the run can be captured and reproduced in the sister location. Likewise, any problems that pop up can be compared to the other location to see how it either solved the problem, or is avoiding it altogether. Using a database created another benefit for the system – data is no longer accessed straight from the PLC. Raper explained that much of the equipment in each plant was running almost entirely on a single PLC and when too many people pulled information from that data point at the same time, the device got bogged down. "All of the data going across the network was getting bottlenecked at a single data point where it connected to the PLC," he said. "By sampling this data and putting it into the database, there was no longer a burden on the PLC. This was a huge advantage with the IA software. Many people can access the data without connecting to the PLC processor directly."